I'm not the best pregnant lady going, I like the bump (most days) and showing it off. I don't like feeling bloaty and unable to do everything as before. I hate the swelling and lack of sleep as I diligently try and stay on my left side in bed. No matter what pillows, wedges and cushions I employ, I always end up on my back or right side. This freaks me out, more in this pregnancy than last time, perhaps again because I know now more than before what is at stake. Little people are the greatest and I want to do my best by both of my babies all of the time. We've had a bit of a rough ride with Bubba lately and so I haven't really focused on this baby. It seems my girl is growing up and deciding that being a little minx is the way she wants to express herself. Everything is a battle and it's exhausting me! My main thoughts (to my shame) have been how ill I've felt, how tired I am and how I've been unable to play the same way with bubba as before. 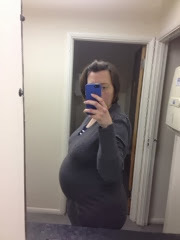 It has been all about me and I haven't really considered the baby growing inside me. It was only when someone said 'you must be so excited to meet your little boy soon'. My first thought was 'erm no' but only because I hadn't really thought I was having a baby. I know, I know, I'm not stupid, I realise that I'm pregnant and having a baby. It's just I haven't got beyond thinking of the here and now rather than what happens next. I've probably had my Anti D injection by the time this post goes live. I'm rhesus D negative which means my body could produce anti bodies and harm my baby (about 12% of pregnant women have to have this). I had to have the injection last time but really didn't read up too much on it so wasn't fussed. This time I googled it and it gave me a mild panic attack and as soon as I did it I knew I shouldn't have. So now I'm going to take my time and try and enjoy this pregnancy. It takes daily reminders to myself that there is a growing baby that needs me just as much as the rest of my family. I'm also due to see the Better Start midwife to help with my anxiety and tearfulness. At first I felt a failure because I thought it shows that I'm unable to cope. Now I'm embracing all the help I can get and realise these emotions aren't ones I can always control on my own. I've started reading this brilliant book on Hypnobirthing 'The Hypnobirthing Book' by Katharine Graves and listening to my hypnobirthing cd just to keep me in the here and now. I had a positive, natural birth without pain relief first time around and as this is very possibly our last baby (I'm not planning more but you never know what my hormones will do in future), I want this birth to be a positive experience as well (even if it doesn't go to plan). Plus I want to try and relax at the moment because it's sometimes hard to do for me to do and trying to be proactive is helping. So here's to focussing on this baby and this pregnancy. The washing up can wait, my girl will love me just the same whether I fall asleep when she wants to play and the hubby, well he can put up with with me moaning and crying for a bit longer.